I have a real simple Thank You card video today. It's so easy and you can use whatever image you want to make this card. I bee buzzing, a training cho'ing, or a simply butterfly would look great too. If you don't have a stamp for the stitching you can just use a black ultra thin tipped marker and make your own stitches. Update: here is the link to the stamp set that has the stitching stamp. What a great card!!!! I like the stitching stamp for the airplane, so cute. That's a really cute card! I always love seeing the different cuts you use that I never noticed and then think, "OOooh, I need to cut that one out!" I thought that with that cute boat on the Father's Day card! Great job - clear instructions!! 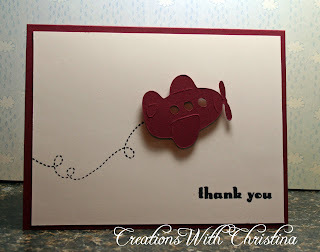 That plane is so cute - I have that cart but never noticed it - can you tell me what settings you had on your Cricut to cut Papertrey's cardstock - I can't get it to cut. Thanks for your videos! The settings I use for PTI paper is pressure at the highest and blade depth at 5. The speed I change depending on how detailed the cut is. I usually always leave my speed on medium.